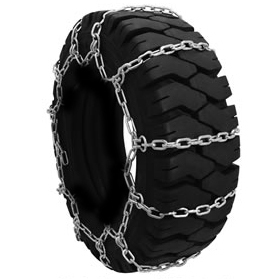 Security Chain Company Quik Grip Forklift Tire Traction Chains are made from 5.5mm Alloy Square Link Cross Chain spaced every 4th link. Square alloy is superior in strength and abrasion to traditional carbon twist link chains and makes it ideal for the heavy weights forklifts exert on tires. Our forklift tire chains come standard in 4 link spacing and supplied with 5-point rubber adjusters to keep the chains well tensioned to prevent chains from walking off the tire. 1. Forklift are extremely hard on tire chains. With no load, tires tend to spin on ice and snow. Avoid spinning tires. 2. Maintain constant traction - brake and accelerate slowly. 3. Avoid sharp turns as it causes extreme wear on chain as weight of forklift pivots. 4. Avoid sharp turns as it will cause cross chain to pull off side chain as weight of forklift pivots. 5. Do not run over metal grates. Cross chains will bind and break. !!! Due to variations in machine design clearance & tire manufacturers' tread designs - Always Pre-Fit Chains Before Use !! !